It’s easy to pick a pediatrics nurse out of a crowd — just look for the Elmo strapped to their stethoscope and the SpongeBob characters covering their scrubs. It takes a specific personality type to work with small children, and it takes a certain combination of caring and strength to care for sick children. 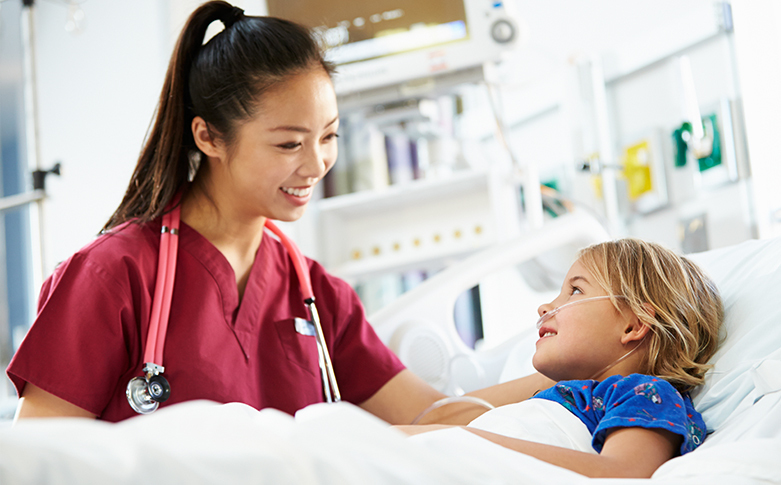 I was intently observing my pediatric nurse coworkers one day at work and gathered a short list of what characteristics pediatric nurses display on a daily basis. Stains in hues of white, off white, yellow, seedy yellow, and of course, various shades of brown brightly adorn your scrubs. And subsequently, you have mastered the creation of the perfect stain remover substance that works best on partially digested formula-based stains. Your locker is also stocked with a spare pink, teal, and Disney Princess scrub top in case of a stain emergency. Your friends who are new parents turn to you for advice on diaper changing skills (heck, you get more practice changing diapers than most parents do with their own kids). You don’t memorize medicine dosages by mg or mcg but instead by weight-based dosing such as mg/kg or mcg/kg. It’s normal to see the fairy godmother frolicking through the halls of the hospital. You think an eight pound baby is one of the biggest, healthiest looking babies you’ve ever seen! You impress your fellow adult health nurses because you can do weight-based dosing calculations in your head without a calculator. People look at you funny when you check the pulse integrity and capillary refill on each new child that you meet, just by habit. You have mastered the art of making saline syringes into water guns, blue gloves into inflatable chickens, and tourniquets into the best sling-shots ever seen. You look forward to seeing clowns at work. Wagons are a hotter commodity than a wheelchair at your hospital. You have memorized the channel numbers for Cartoon Network, Disney Channel and PBS kids. Lidocaine cream is your very best friend. When it snows, your patient population is almost as excited about eating the snow as they are playing in it. Until your eyes adjust, you almost need sunglasses when you first get to work to help shade some of the bright colors that bounce off the walls of your floor. Your patients don’t sleep at night — instead they demand to eat all night long (but you don’t mind)! Diapers harbor multiple functions including using them as a boxing glove to wrap up IVs so they don’t get pulled out. The art of distraction is the best pre-med you have found. You have mastered the skill of holding a baby in one arm while changing a bed with the other. Your downtime is spent loving on babies whose parents aren’t at the bedside. Sometimes multiple patients can be found nestled in the arms of nurses behind the desk. You can swaddle a baby and have them asleep in 2.5 seconds. Even your strapping attending physician speaks in higher child-like tones when speaking to his patients. Your favorite part of the day is seeing a mother dress her baby in his “home from the hospital outfit,” free of wires, tubes and drains, and then watch her take him home for the very first time. Your refrigerator looks like a preschool art class exploded on it. You know you are a pediatric nurse when you get excited each day that you come to work because you get to experience one of the most endearing, resilient, and beautiful patient populations.